Chuck Jones Center for Creativity Hosts Community Projects This Sunday! Ripple Kids, a nonprofit seeking to inspire and empower kids to take action in their communities is hosting a Project Fair this Sunday, October 19, from 12 PM to 3 PM at the Chuck Jones Center for Creativity, SoCo and the OC Mix. 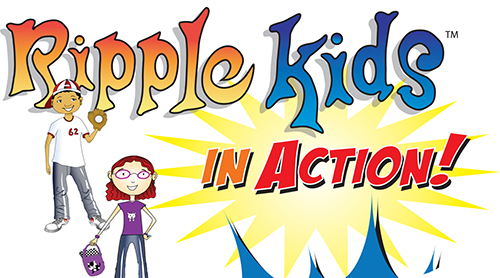 A Ripple Kid is a kid who has identified an issue and has taken action to resolve it. This event will feature 10 free service projects located at several retailers addressing a variety of causes from hunger to the environment. In addition, we will have several nonprofits there to let kids know about their cause and how they can get involved. The Chuck Jones Center for Creativity will serve as a venue for two projects – Stop Hunger Now and Project Hope Alliance. Stop Hunger Now packages meals for kids in 3rd world countries using an assembly line formation that is very energetic and engaging for the participants. During our last event in June, we packaged 15,000 meals for kids in Vietnam. For the Project Hope Alliance project, volunteers will be assembling art supply kits for kids in need serviced by PHA. Please join us in welcoming Ripple Kids to the Center and come on down to participate in these worthy causes! Sunday, October 19, from noon to 3 PM. The Chuck Jones Center for Creativity is located at 3321 Hyland Avenue, Suite A, Costa Mesa, CA 92626. Visit https://rkia.eventbrite.com to RSVP or to volunteer! Sangria and Sceneries - Thursday, March 13 at 7pm! Join us for Sangria and Sceneries, the next class in our Palate and Palettes series! Learn to paint a landscape using the colors of the rainbow. When you complete your masterpiece, you'll have a canvas with the perfect view! You bring your wine and snacks, and we provide the materials and canvas! Our first Pinot and Picasso was a sucess! On Thursday night (February 6, 2014), people from all around Orange County got together at the Chuck Jones Center for Creativity to participate in the Center’s first-ever Pinot and Picasso.We were joined by groups of all kinds – families, couples, mothers with their daughters, and friends out for a night of fun. There were people from all skill levels – from those who haven’t picked up a brush since elementary school, to those who have missed the familiar feel of a paintbrush in their hand. When the guests arrived, they all enjoyed wine, cheese, and other bite-sized treats to go along with their painting lesson. They were provided with a 16x10 canvas, a palette, paintbrushes, and paints, and each sat across from their partner. The class was led by Chris Scardino, and he taught everyone how to paint basic dimensions of a human face and head. His class was loosely themed around various eras of Picasso style portraits, and everyone released their inner Picasso. They filled up their palettes with paints, and got creative with different ways to capture the personality and quirks of their partner. Enjoy dinner without the kids, but have them nearby! "Drop Off" your children at the Chuck Jones Center for Creativity and "Dine" at one of the restaurants at SoCo or the The OC Mix. Your kids will participate in various creative activities with the inspiration of Chuck Jones's animation, film, and fine art. -They have to be your children, no piggybacks allowed! -Must register 48 hours in advance. If the program doesn't meet the minimum required, you will be given a full refund. -When registering, include your child or children's names and ages in the comment box upon check out. Join us for Drop In and Draw this Saturday, February 23! Stop by the Chuck Jones Center for Creativity this Saturday, February 23 for Drop In and Draw! You can grab a pencil and sketch a loveable Chuck Jones character, like Wile E. Coyote or Pepe Le Pew. Not comfortable sketching your own Chuck Jones character? Then grab a "Color Me Creative, Volume 1" coloring book, created by our own Linda Jones, the daughter of Chuck. We've compiled some of Chuck's original sketches all in one book!Doug Lothers, our volunteer teaching artist, has a background with the “classic” animation style. He can help guide you with drawing one of Chuck’s loveable characters! Rinette Heajin, our volunteer teaching aide, can assist you with learning how to draw. She’s been studying art for over 3 years at her school and private academies. The OC Mart Mix....The home of the Chuck Jones Center for Creativity! Artables with Gina Latora -- Children can create art with string, paper, glue, cotton or whatever else Gina can think of! ...And as always, we'll have our Drop In and Draw supplies! Our volunteers will help you think of ways of how to be creative--and we'll provide the supplies! Everyone is welcome! Stop by and see what the Center has to offer!